This Valentine’s Day instead of saying “Be Mine” I’m going with “To Thine Own Self Be True”…and with that, I’m going to treat myself to a five-star meal and enjoy a good glass of red wine with one of my best friends! I was thinking about it – as children we’re taught to ask others to love and commit to us via beautiful Valentine’s cards cluttered with hearts and arrows. We went to school and passed those cards out to all the other kids in class. And then a question came to mind, why didn’t our mom’s ever have us write a Valentine to ourselves? I don’t think we are taught to love ourselves and truth be told, it is something that can take a lifetime to learn. I once read that your greatest love affair should be with yourself. This month I want to challenge you to look at the love and commitment you give yourself. I know how it is. You are juggling your responsibilities with home/work and your relationship/kids/family/friends. You take care of everyone else before you even give a thought to yourself. This month will start a new routine, one where you set aside some time just for you! I want you to make a commitment to yourself. Start small because creating a new habit takes time. Ease into your new routine by setting aside 15 minutes of “me” time a day and commit that you will be #1 on your priority list during that time. Do something you want to do. But remember, this is something you want to do, not have to do. This can be hard for all of us that are constantly caring for others. The first step, ask yourself what do you want to do? Grab some paper or your smart phone and make a list of things you would enjoy doing that you have not made the time for in the past. You may decide to go to the gym, watch your favorite show, start a journal, get your nails done, buy yourself something nice, take a nap, practice meditation, or treat yourself to lunch. Maybe you’d rather take a class on a topic you’re passionate about, if you don’t have the resources to take a class – read about a topic that can benefit you from nutrition to business, knowledge is only a keystroke away. What you do with this time is completely your call – and please know that you deserve it! Gradually you can increase your time to 30 minutes or even work up to an hour if you decide to head to that yoga class. Keep adding to your list because the more you practice this, the more you will find you want to do. As the person who is always doing something for others, it might be difficult at first to come up with a list of what you want. If you’re caught staring at a blank piece of paper, start writing down things that “scare” you or challenge you to get out of your comfort zone. I’ve found if I step out of my comfort zone I tend to experience the greatest personal growth. When I’m out of my comfort zone I might not succeed at the item I’m attempting, but I still get an “A” for effort. When I spoke at Pure Romance’s Platinum Tour, I discussed doing one thing that “scares” you each day. When I take the stage, it may seem natural, but I still get butterflies. I get up there, even though the butterflies are swarming, and I hold myself accountable to who I am, to my family, to my Consultants, and to Pure Romance. However you get to your list, make sure to keep a copy close by so you can re-read it, check off items you accomplish, and add new ones. Frequently reviewing your list will help you stay on track in your assignment of you. Be true to who you are and honor the commitment you make to yourself. 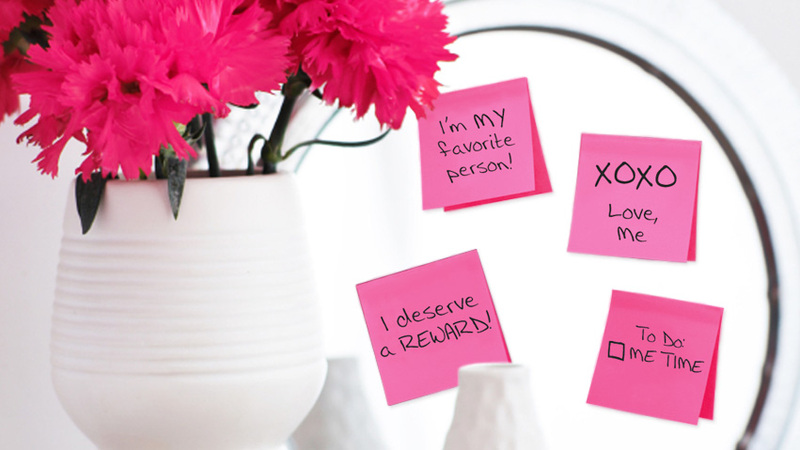 Write a love note, but this time make yourself the recipient! If you find it hard to write that love note, because it can be difficult to do, write down the positive comments that others say about you – or even what you like most about yourself and own it! Valentine’s Day doesn’t have to be one day, it can be the start of a new chapter in your life. So, what are you going to write on your Valentine to YOU? Hold yourself accountable, next Valentine’s Day take a look at what you wrote and ask yourself if you were true to your commitments. 4 Responses to "Monthly Resolution: Love Yourself!" Awesome article thank you.we need this in yourS A . That is an awesome Resolution, something we all put to the wayside. Thank you for the reminder. I can’t tell you how incredible your timing is. I just went to a therapy session yesterday (1st time in 8 years) because I’m still struggling with self esteem issues- a result from junior high bullying. My therapist told me to stop looking at my flaws and to focus on the positive. I couldn’t express enough to her how much Pure Romance has helped with my confidence and that my best friend’s husband said, last weekend, “I never realized how pretty Kathryn was until I saw her full of confidence.” He’s known me for 7 years. This was such an awesome thing to hear from him especially since I’d just done a party for the girl who bullied me in junior high the night before. Very therapeutic!!! So thank you, Patty, for this post and for Pure Romance. It was schamazing to breeze into my former bully’s house, do her party with confidence and professionalism and breeze back out with her money in my pocket. Well said Patty! I so agree.